UK General Election 8th June: Shake it all about? Re: UK General Election 8th June: Shake it all about? May might not, but remember, 75-80% of Tories do see Scotland and NI leaving as being worth the price of Brexit. And if Scotland leaves, it puts Labour in a very bad electoral position - I don't see them winning back those 41 seats any time soon, but without them and a reduced overall seating in Parliament, they'll be struggling to get a majority at all. Yikes, that would basically make Wales and England a one party republic of Tory. I'd not considered that, what a horrible thought. The idea of Scotland leaving I find weird because it would have the same border issue, and with the Tories being the dominant party of the what's left... I can see Pent and Payne out there feverishly rebuilding Hadrain's wall with bricks and mortar. The Northern oilfields dispute would also turn from a national one into an international one, as a third party nation tries to muscle in on resources claimed by an EU state. No, they'd go all border reaver and burn York down. Again. I am still trying to see any advantage at all to Brexit other than "assbag nationalism." We will have the freedom to fail miserably on our own. So, if a backstop agreement cannot be made by the end of this month, France has said it will not have further meetings with the UK next month. Negotiations would have to start again in December, but Parliament has Christmas holidays from Dec 20 to Jan 7, and government generally winds down after the first 2 weeks of the month anyway. 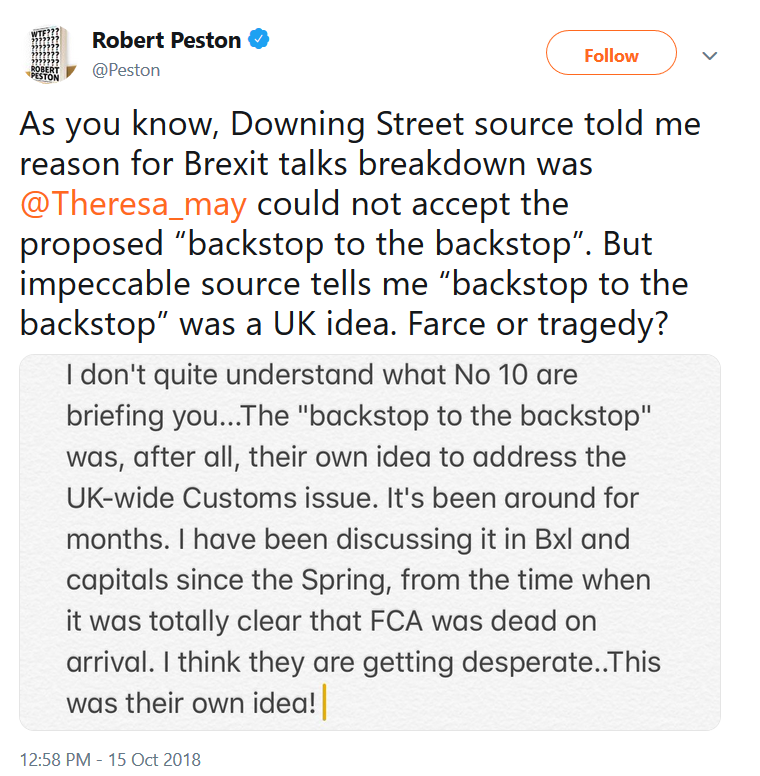 If a backstop cannot be agreed then, it means there will be under 3 months to agree a deal, get the deal past Parliament, and then have every other EU state agree on it. Brexit hardliners will say the backstop is remaining in the EU by stealth, and will not agree to it. The UK cannot legally agree to a deal which places Northern Ireland on a different constitutional setting than the rest of the country, by making the backstop only apply there, and if they try, the DUP will collapse the government. They might collapse the government anyway, depending on what happens with the upcoming budget. Remain in the EU full, or crap out on no deal, and than a hellish series of WTO schedule objections just to get on the same footing as all other WTO countries. Say the government collapses and corbyn comes in, he has been more open to Scottish independence, not really open to another vote on brexit, and was open to an NI border poll. I imagine cutting parts of the UK adrift just to get brexit through the door is not an option (as much as I would like to see a united Ireland in my lifetime, though I think now is not the time). Literally everything other then remain sounds like a disaster, on either a European or World scale. The DUP have been preparing for a No Deal, much like the Tory Brexit hardliners. If they withdraw support, it won't collapse the government right away, but it will likely trigger a no confidence vote. That will take at least a week. Then, if May survives, she will have to limp on with no majority and half the backbenchers wanting her dead. If she doesn't, the new leader will still have to choose between the DUP and the European Research Group ultras on Brexit. Either one presents significant risks, someone likely cannot become leader without ERG support, but cannot govern the current Parliament without the DUP. A leadership contest will take likely another week, though given the fractured and weak nature of the Tory front bench, this could extend to two. So there would have to be another election, if a solution cannot be found that pleases the contradictory demands of the DUP and ERG. That would require 2/3rds of Parliament to vote in favour of it, to waive the Set Parliament Act. Lets be generous and assume 1-2 weeks for that debate. Then there would need to be another month for the election to take place. By now, this process has likely taken up more than a month. However, if we assume the government falls due to the budget, then that puts the election during Christmas/New Year. Parliamentary recess and common sense makes that impossible. Instead they will choose either January 3rd or 9th. The Tories still have a 4 point lead over Labour in the polls, though the above could definitely change all that. But if that advantage remains, that puts them a point below the last election, meaning they would likely still win, but without an outright Parliamentary majority. The Tories have to choose between minority rule or coalition, bringing them back to where they were during the leadership race. It's now the middle of January, and nothing has progressed on Brexit. You guys need Cromwell. Just for a couple of weeks, he was very efficient. Seriously, at this point, throwing Brexiters in the Thames is a matter of personal survival. But if we throw them in the Thames, what will we eat once the shops run out of food? My post-Brexit plan involves: burning copies of the Sun and Mail to keep warm, eating Leave voters and travelling the country in an armoured bus with an advert about NHS spending on the side. I'm in. We have a massive stockpile of scottish unionists up here I've been fattening up for the lean times. Trust that will be enough to pay for my bus pass?